If you’re fortunate enough to have a beautiful deck at home, you should probably think about what it says to people who come over. Does it invite them to sit down and stay a while or does it make people wonder if you ever even use this beautiful space? Perhaps you need some help decorating your deck, and may find our tips useful. You can change the entire look and feel of your deck in no time with these simple decorating tips. Now that winter is finally over, it’s time to get your deck ready for warm weather gatherings. 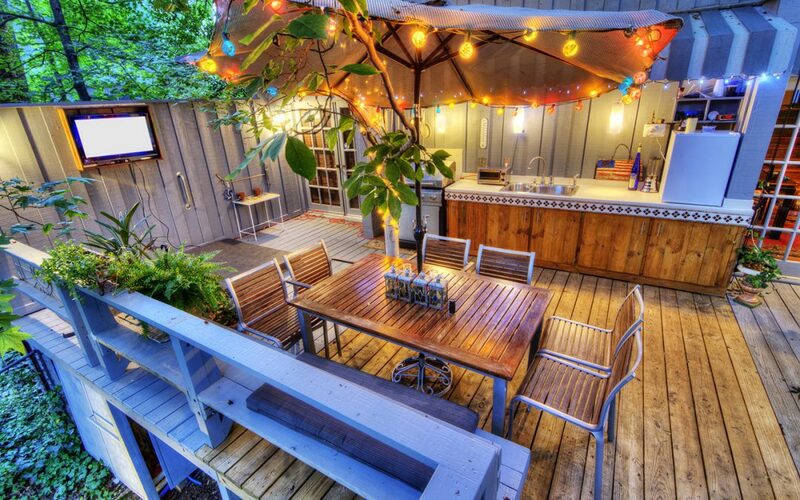 The best way to go about decorating your deck is by creating a main focal point. Perhaps you have a fire pit you want to turn into the main focus, or you have an outdoor kitchen with a television on the wall behind the bar. Whatever you want to focus on should be the main event on the deck, and that’s what you use as the main aspect of your décor. Once you have a focal point, you can start decorating around that. A conversation area is perfect for any deck, especially if you’re unsure how you want to go about decorating your deck. Start with a large outdoor rug, and add a sectional, a few chairs, or a small couch and chairs. Put an outdoor coffee table in the center of the furniture for setting down beverages, and make sure you have outdoor throw pillows on the couches to make them more comfortable. This is where your guests will go sit down and enjoy their time together, and it’s where you’ll want to curl up with a good book on a beautiful day. It’s inviting, and that’s exactly how you want your deck to feel. Whether you like formal or informal, an outdoor dining area is always preferable to indoors on a nice day. You get to sit down with your friends and family over nice meals and enjoy the great outdoors. One of the best ways to do this is with a great table that has plenty of seating. Choose one that’s long and welcoming, and make sure you don’t skip the next step, which is all about ambient lighting. The number one mistake you make when decorating your deck is not including the right lighting. It’s not fun to spend time outdoors when there are no lights, and it’s certainly more enjoyable to spend time outdoors when you have fun lights. The lights on your house should be decorative and make a statement at the same time, but it’s the lanterns and the fun hanging lights that add the most fun. If you have a pergola, drape white Christmas lights around it all year to add light and beauty. Hanging lights create a garden feel to any outdoor space. Your home is where your heart is, but it’s decorating your deck that might make the biggest impact on any household. It’s about to be the season of outdoor living, and people want the nicest outdoor space with the right balance of comfortable and fun that’s also useful and inviting. You want to have the best deck in the neighborhood, and these tips can help you achieve that in no time. Cowan Inspections Group serves Salt Lake City, Park City, Evanston, WY and the surrounding area with a wide range of inspection services. To discuss your inspection needs and set up an appointment, contact us!